The Peugeot 908 RC has been a concept car for the European car manufacturer in 2007 at the Paris motor show. 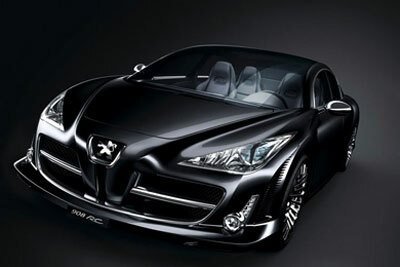 It showed how Peugeot is getting through with their cars in the future. In terms of stylish looks as well as the performance that was shown by their concept car, the car manufacturer is sure getting on the right track. The Peugeot 908 RC is a car with a luxurious saloon body encasing a chassis of a racecar. It is quite a combination that will appeal to car enthusiasts who look for both stylish looks and racing performance in their vehicles. At the heart of this concept car is the Peugeot V12 HDi DPFS that creates 700bhp worth of power and a road-rippling 885lb. ft. of torque. It is being groomed to take on the Audi R10 racer which took the Le Mans honors last year. On top of that, the Peugeot is doing its part for the environment by having the 908 RC equipped with a pair of particulate filters that helps keep away the diesel soot from escaping into the atmosphere. In terms of looks, the Peugeot 908 RC was designed with the feline look in mind. Its headlights were designed with "eyes" in the center. It comes with a muscular wing lines that are enhanced by huge chrome alloy wheels that come in 20 inch rims in front and 21 inch rims at the rear. The body is made out of race car grade materials with carbon fiber and aluminum-honeycomb structures. The car’s interior offers a more comfortable seating area and features every bit of luxury items that Peugeot can stuff into its car. It is a concept car that has some sense of reality to its nature. It would only be a matter of time if Peugeot would really make this wonderful concept car available for the buying public.